At a meeting of the European Physical Society held in Stockholm, the International T2K Collaboration announced on July 19, for the first time in the world, the definite existence of the "Electron Neutrino Appearance Phenomenon" in which a muon neutrino transforms during flight into an electron neutrino. To announce this development, the participants in the experiment-the High Energy Accelerator Research Organization, Institute for Cosmic Ray Research (University of Tokyo), and J-PARC Center-held a press conference in Tokai. 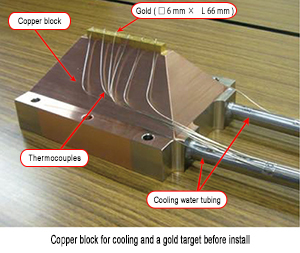 In the T2K Experiment, a large quantity of muon neutrinos is produced at J-PARC and directed at the Super-Kamiokande detector located in Hida City, Gifu Prefecture, about 295 km away. 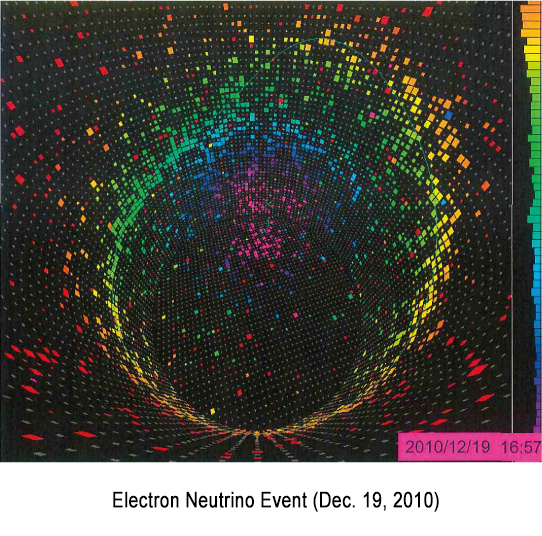 The system detects the faint light (Cherenkov light) produced when neutrinos react with the water in the detector, and this was used to investigate the percentage which transformed into electron neutrinos. Full-scale measurements began in January 2010, and the recent result was obtained by analyzing data accumulated up to April 12, 2013. It was found that 28 of the 532 detected neutrinos were electron neutrinos. The Collaboration will further experiments, and close in on the riddle of the origin of the universe. * Click here to enlarge. 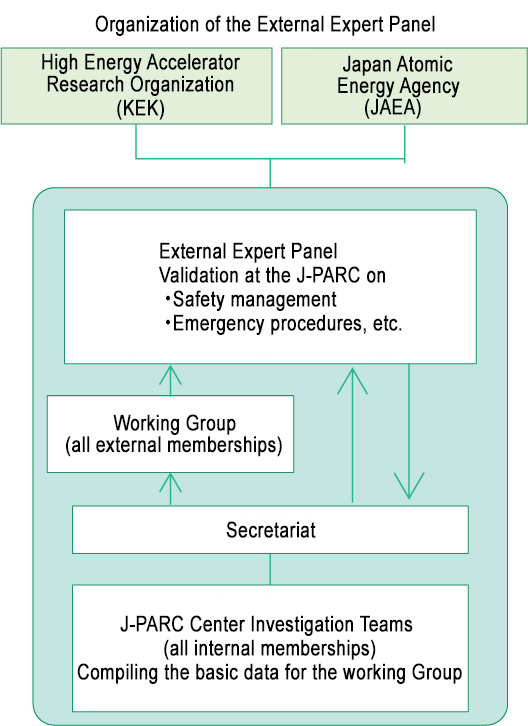 Since the first meeting on June 21, the members of the External Expert Panel have held a meeting about once every two weeks. At these meetings, a Working Group has been set up as the implementation system to ensure that evaluation work proceeds efficiently. The Working Group is comprised of outside experts with a high level of expertise in the operation and management of accelerator facilities. The leader of the Working Group is Professor Makoto Inoue (Professor Emeritus of Kyoto University) and the group has met four times thus far. 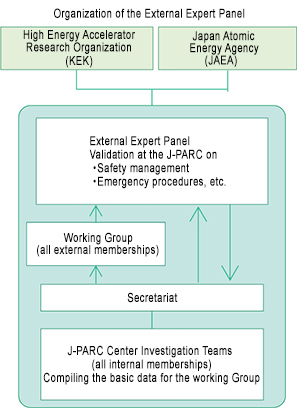 An investigation team comprised of members of the J-PARC Center has furnished the Working Group with data, plans for future improvement and other information to serve as the basis for their investigation of the accident, and the group has discussed and examined this material. The results have been reported to and verified by the External Experts Panel. 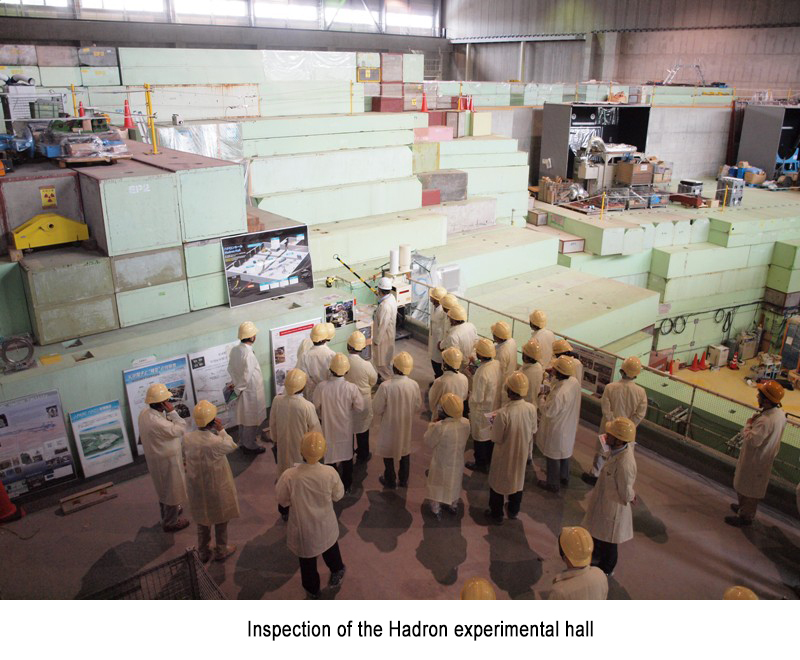 So far, the discussions have covered measures to prevent recurrence, the safety management system, procedures to be followed in case of an emergency, and the soundness of facilities other than the Hadron Experimental Facility. Since the second meeting, the meetings of the panel have been open to and can be attended by the public. A meeting to explain the project plans for fiscal 2013 of the Nuclear Science Research Institute was held for members of the Tokai Joint Resident's Association. 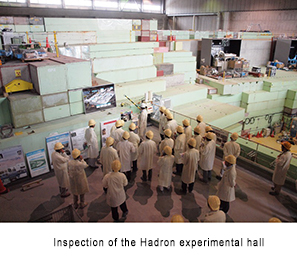 At this meeting, Dr. Naohito Saito, Deputy Director of the J-PARC Center, reported on the recent accident of the J-PARC Hadron Experimental Facility, and responded to questions. There was also an inspection of the accident site. The Tokai Joint Resident's Association is comprised of representatives of 30 community associations in Tokai Village, members of the board and a secretariat, and 47 people attended this meeting. 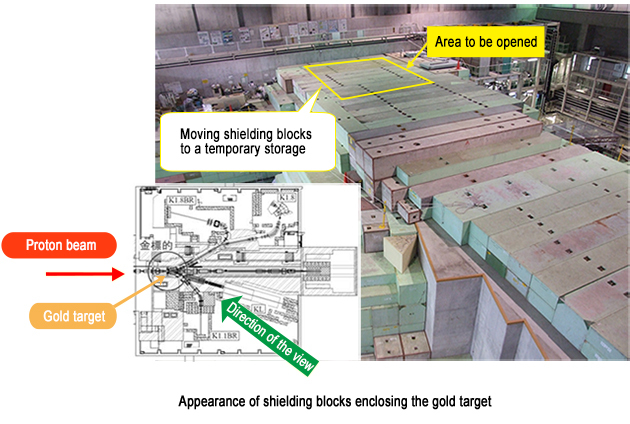 During the recent radioactive material leakage accident at the Hadron Experimental Facility, it is thought that the gold target was exposed to an intense proton beam for a short time, resulting in partial damage, and the release of radioactive material from the target. Measures will be devised to prevent any recurrence in the future by investigating the state of the gold target and the surrounding contamination situation, and determining the route of leakage. To proceed with this investigation, we are removing contamination using charcoal filters and other techniques to reduce the level of radioactive material in the accelerator tunnel. 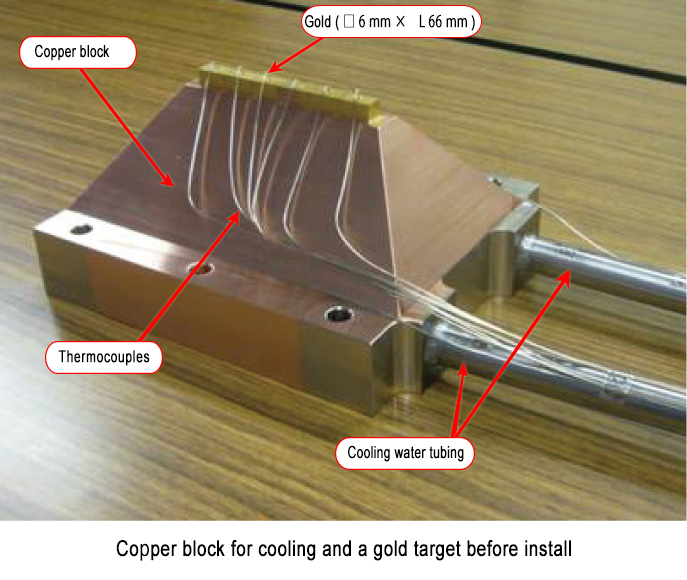 We also plan to move the upper shielding, and directly inspect the target with a fiberscope, and preparations for this task are currently underway. When starting work, we will explain the situation to members of the local community, obtain their understanding, and proceed while taking safety issues fully into account. J-PARC has established a dedicated hotline to listen to the opinions of everyone concerned with the accident, and respond to questions. Please call and give us your frank opinions, or ask any questions you have. ●Elucidation of the Mechanism underlying Ceramic Capacitor Performance through Muon Beam Experiments!